Meet the 2018 4-H Camp Timpoochee Staff! Thanks to 4-H Camp Timpoochee’s Resident Director, Ariel Blanton, for interviewing her staff for us. Next week, we’ll learn about Ms. Neva’s staff at 4-H Camp Cherry Lake. If you’d like to learn more about 4-H Camp and its positive impacts, contact your 4-H Agent: http://sfyl.ifas.ufl.edu/find-your-local-office/. Meet the 2018 4-H Camp Cherry Lake Staff! Can you believe the first week of 4-H Camp is right around the corner? Your 4-H Camp Cherry Lake staff has been training hard getting ready to make your camp week the best ever. Ms. Neva Baltzell, 4-H Camp Cherry Lake’s Resident Director, is proud to introduce you to her camp staff. Thanks to 4-H Camp Timpoochee’s Resident Director, Ariel Blanton, for interviewing 4-H Camp Cherry Lake’s staff. We can’t wait to meet them in person! 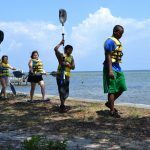 If you’d like to learn more about becoming a 4-H Camp Staff member during next year’s camping season, contact your 4-H Agent: http://sfyl.ifas.ufl.edu/find-your-local-office/. Max (far left) along with other graduating seniors at camp last year. Congratulations to all of our grads in the district!!!! It’s graduation season, and for many 4-H agents, this is a bittersweet time. 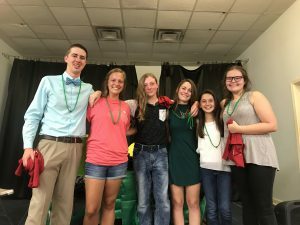 On the one hand we are seeing our senior 4-H’ers accomplish big goals and reach out to take hold of their dreams for the future. On the other hand, it can feel like we’re losing them – or at least in their current roles – the best always seem to boomerang back. One such 4-H’er that I’ve had the pleasure of working with, and who will be missed terribly this summer is Max Scott. He has developed all 4 H’s (head, heart, hands, and health), and even the sometimes joked about “5th H”…hustle. But by far, Max will be known for putting his heart into everything he does. “4-H has helped to teach and reinforce many positive qualities in my life such as honesty, hard work, and patience. I first got involved with 4-H by winning the countywide 4-H Tropicana speech competition in fifth grade. One of the rewards for winning was a free trip to 4-H Camp Timpoochee. I soon learned that one of my best friends was planning on going to camp also, so I went, and there began my 4-H journey. After several years of attending as a camper, I was finally able to go as a counselor. Max has indeed done just that. He quickly became the most requested cabin counselor among my young 4-H boys, and just this week an excited camper came in my office to sign up for camp. He shared with me that last year was his favorite year of camp yet. I found that interesting since this camper has been for a number of years and it rained all day every day last summer, so I asked him why that was. His reply? “Because Max was my counselor. He’s the best.” I couldn’t help but grin. As I sat through a rather lengthy graduation ceremony last night for no other reason than to support this young man, I was reminded of just how much he has grown since I first met him as a cautious, shy, 11 year old boy. Since then, he has been elected to several offices in school organizations, serves on the executive board of the local republican party, has paged at the capital in Tallahassee, earned the honor of being his class valedictorian, and was voted most likely to succeed by both his peers and faculty at his High School. With his sights now set on law school and perhaps political aspirations, I know that Max is in for a bright and glorious future. I’m so proud of him and all that he has accomplished. Surely he will be missed this summer, but I know I will not be surprised to find another young Max in the crowd at camp this year, eager to find his footing and become just as great a counselor as Max was. As you can see, Max is always thinking of others and how they can leave a positive influence on the lives of others. For more information on how you, like Max, can make a positive difference in the lives of youth in our community, contact your local UF IFAS Extension Office. There are only 11 days before my boys will be home all day, luxuriating in the A/C, gaming, sleeping and eating everything in the pantry. Or so they think. I just can’t stand the thought of them doing that, so I’ve booked them for a couple of day camps, overnight camp and lined them up to work for my parents. Now don’t get me wrong; I believe in down-time, me-time and quiet-time, but I also believe in making sure they’re brains don’t turn to mush, they love learning, develop a strong work ethic and experience some new things. Because your 4-H Agents are youth development professionals, (folks who know how to provide programs and experiences that help youth reach their full potential), you can bet that 4-H day and overnight camping programs will benefit your child. Activities and experiences are tailored to meet the developmental needs of your child while they experience success but are also challenged to think. Don’t be afraid to give them a little push to try new things. In the Northwest Extension District spanning from Escambia to Jefferson counties, we have several district-wide programs that may be offered in your county. Each county may also offer more camps in addition to these. 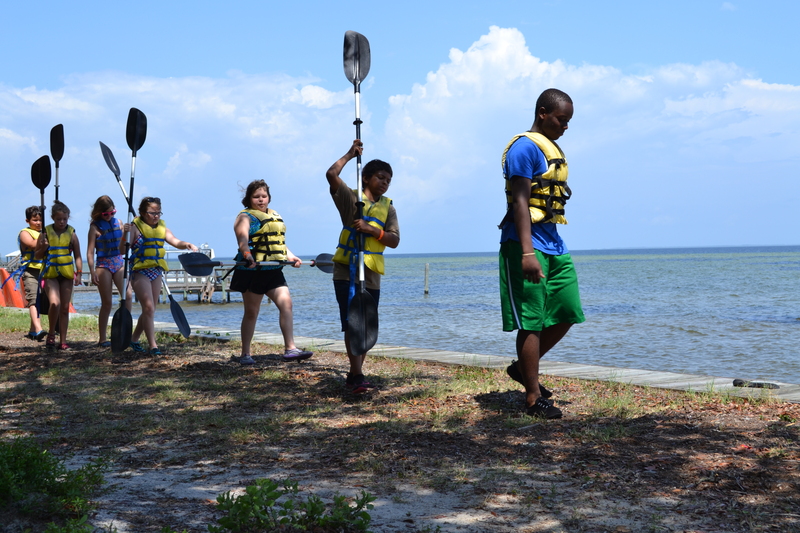 To find out about summer programs in your county, visit http://sfyl.ifas.ufl.edu/find-your-local-office/.